The 34 metre motor yacht Black and White is sold as Foulques de Raigniac at Camper & Nicholsons tells me he's found a buyer for this listing for sale by Roy Klajman at Sea Alliance. Built in GRP by UK builder Sunseeker International with naval architecture by Don Shead, Black & White was launched in August 2010. She is a very highly customized version of the popular Sunseeker 34 Metre Yacht series, with a specification that surpasses many of her predecessors. The interior features fully custom and exclusive Fendi hard furnishings, opulent Frette linen and design accessories and a Bang & Olufsen lifestyle surround-sound system throughout. Her five staterooms provide generous guest accommodation for 10 guests. The master suite features a king size bed, and there are two identical VIP staterooms and two mirror-image twin cabins. All staterooms have en suite bathrooms. Black and White also features a large flybridge complete with a centrepiece Jacuzzi, as well as a large bar for al fresco entertaining. 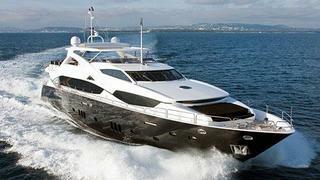 Twin 2,434hp MTU engines give her a cruising speed of 20 knots.